Princess Magnolia and Princess Sneezewort duck under tables and Princess in Black and Princess in Blankets emerge to tackle the growing goo monster threatening to "EAT SCIENCE FAIR!" 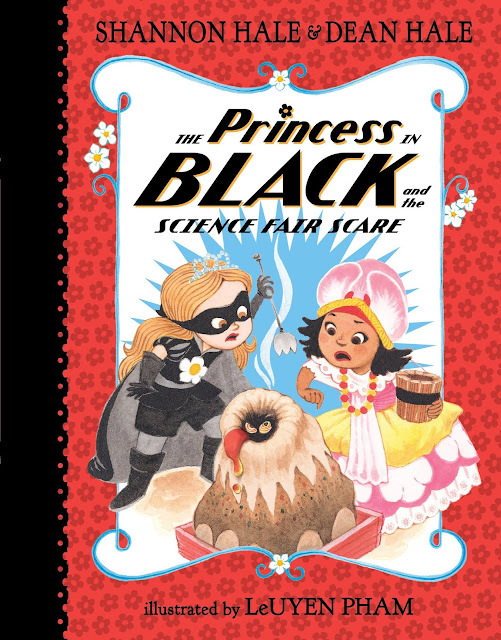 Together, all the princesses, disguised as their alter-egos or not, come up with a solution. 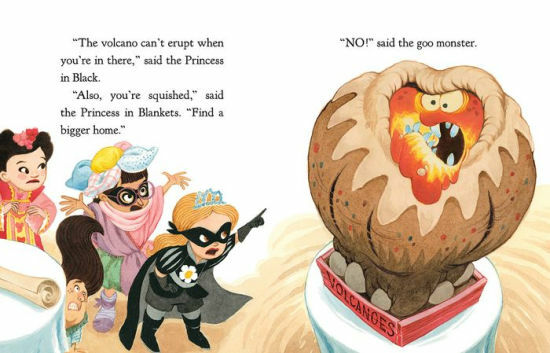 In a hilarious illustration, they are all seen on the train, the impatient goo monster confused and a bit befuddled. Together, they even devise a science-fair-worthy method for working as a team to transport him to the goat pasture. There, the Goat Avenger is fighting off a purple monster (with a feather duster) when the monster sees the new arrival, declaring, "NEW FRIEND?" Happily, the takes the goo monster below ground to monster land. The herd of princesses return to the science fair exhilarated by their adventure and the Bucket Boosting Teeter-Totter they built together. 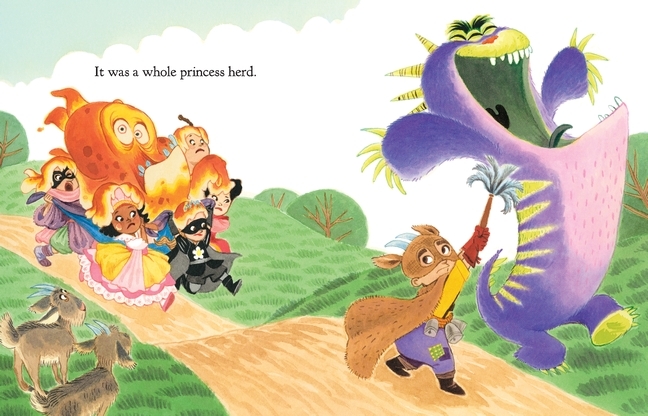 Could the ranks of princess heroes be about to get bigger? The final page of the book gives a spectacular answer! Illustrations: As always, Pham's illustrations are filled with humor, a palette that bursts with bright colors and charming characters you wish were your friends. She excels at creating monsters that are just the right amount of scary and just the right amount of cute. Why Read? Why Buy? : If you or the young ones in your life have read any of the first five books in this series, I don't need to tell you why. If you are new to this series, please start reading with Book 1 and read them in order, if possible. The Hales are masters at crafting a short chapter book that is highly engaging and filled with positive, empowering characters and actions. 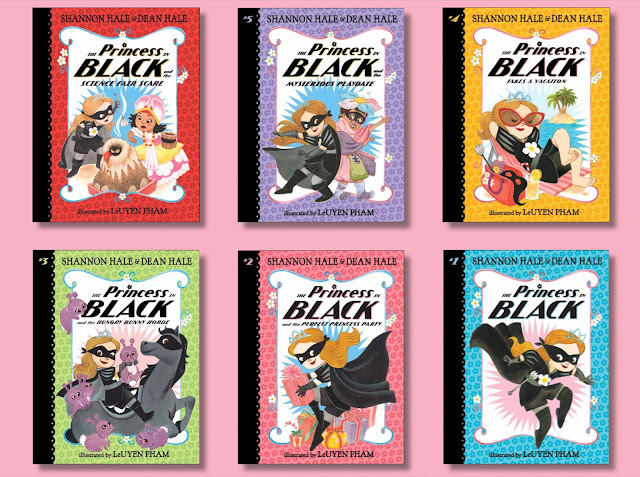 While there are princesses all over the place in the world of kid's books, when this series started in 2014, the "princess as super hero" concept was new. Inspired by their four daughters, the Hales and Pham have created a (long running, I hope) series of books that help kids move from leveled readers to chapter books.